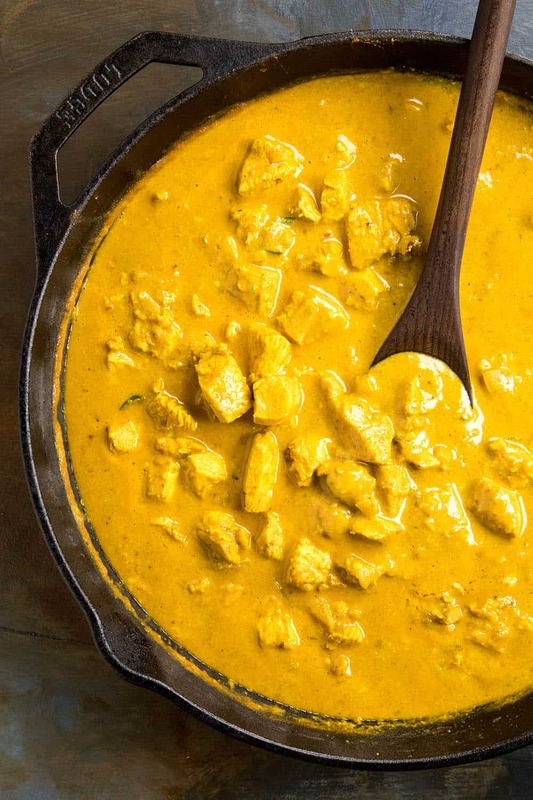 My chicken korma recipe is derived from classic ingredients and spices from India, with chicken marinated in a homemade korma paste and yogurt, then cooked quickly and simmered with cream. Mild in heat, but big on flavor, it’s a spicy food lover’s dream. If you’re a spicy food lover, I’m sure you’ve worked your way into curries. Curries are typically quite spicy though the levels of heat will vary from dish to dish. 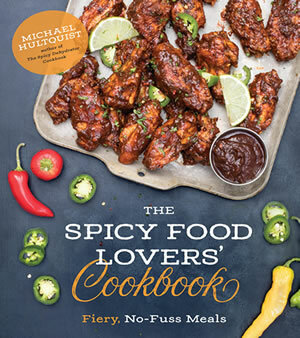 Spicy, of course, means the recipes uses a lot of spices and certain fresh ingredients. It doesn’t always mean “hot”, though it can. 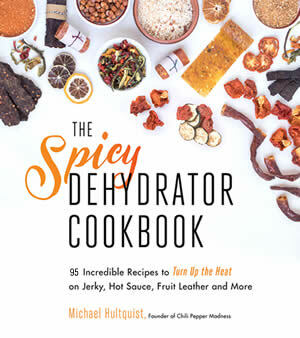 Most people who enjoy spicy food find their way to Indian restaurants or Thai restaurants, seeking out those curries and other dishes with big spice. I had my first taste of chicken korma at a local Indian restaurant quite a long time ago and was instantly smitten. Such a delicious dish. Like many Indian recipes and curries, it doesn’t have a lot of heat, though you can adjust that to your own personal tastes, as I do. But when it comes to flavor, BOOM! Chicken Korma truly delivers. Korma is the general name for a dish of meat and/or vegetables braised in a yogurt or cream sauce. A variety of spices can be used, as well as stock or water, along with various meats and vegetables. 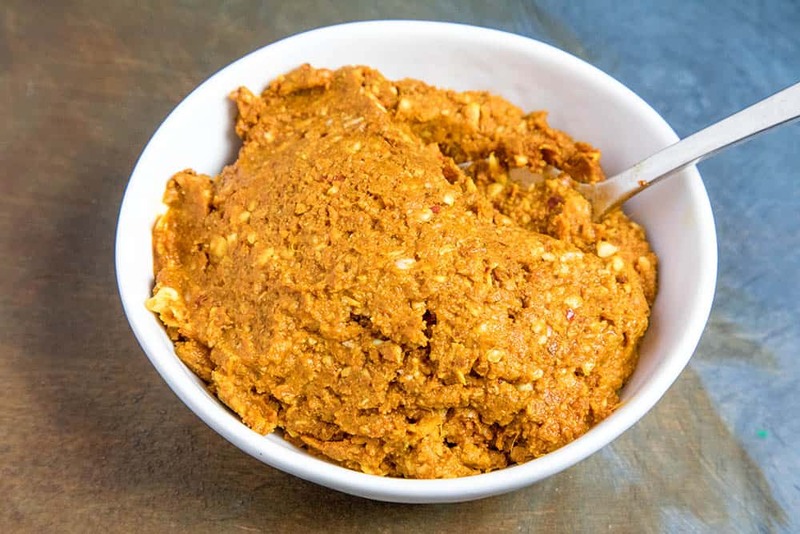 As the mixture simmers, it thickens into a flavorful sauce. Korma originated in Indian and has spread through the local region. As with any type of recipe like this, you’ll find variation after variation, depending on the location and the preferences of the cook. My recipe is a result of numerous efforts. I’ve made different korma recipes and versions, and this is the one that I prefer. When I make it, this is the exact way I make it. It’s the best recipe for chicken korma around. 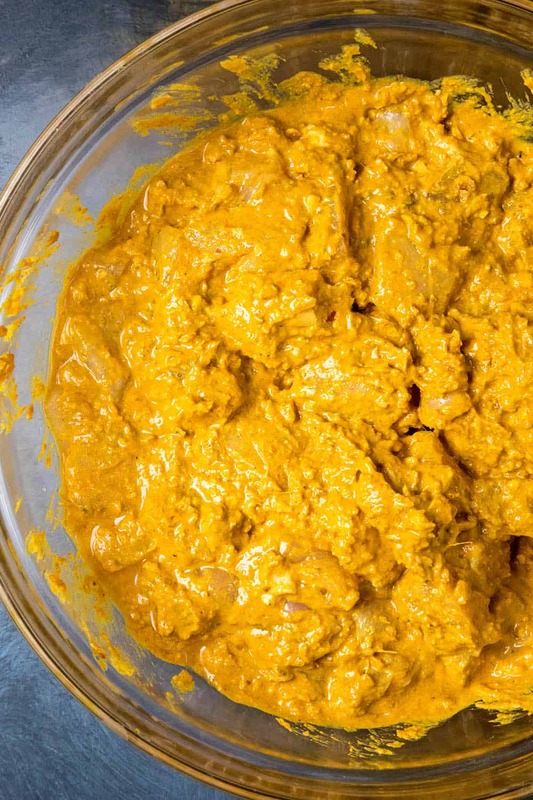 Let’s talk about how we make chicken korma, shall we? I will also offer ingredients alternatives so you can make the recipe your own. When making this dish, it is easiest to break it into simple steps, as there are quite a lot of ingredients. Don’t let that frighten you. It is still an easy recipe that I make all the time. 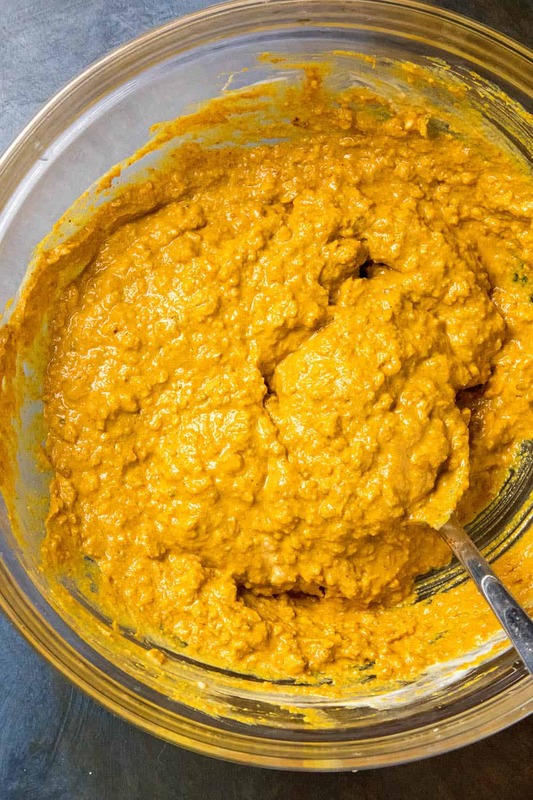 First, make your korma paste. Add the cashew nuts to a food processor and pulse to break them up. Add the tomato paste, garlic, ginger, and seasonings. Add salt and pepper to taste and pulse to form a thick paste. If it is too thick, add a couple tablespoons of water to thin it just slightly. It looks like this in the food processor. Here I’ve moved it to a large bowl. You can see how thick it is. Next, Mix the paste in a small bowl with the yogurt. It gets nice and wet. Next, spoon the korma sauce over the chopped chicken and mix well. Cover and refrigerate at least 1 hour to marinate and let the flavors develop. You can leave it overnight to develop even more flavor. TIP: You can do this at home in the morning or the night before to save you lots of time making the next dinner. When you’re ready to cook, heat the oil in a large pan. Add the peppers and onion and cook them down for 5 minutes to soften. Add the chicken with all of the marinade (Korma sauce) along with the chicken stock. Stir and cook for 15 minutes, stirring here and there. Stir in the heavy cream or coconut milk and simmer for 10 more minutes. Do not let it boil. You can simmer longer if you’d like to let the flavors develop more. Garnish with fresh chopped herbs, spicy red chili flakes, and cashews to serve. You can garnish with parsley, basil or cilantro, or whatever herbs you might prefer. It turned out great! Very easy chicken korma recipe for quick weeknight meals if you can get the marinating going ahead of time. It’s very easy to double up on this recipe and make a big batch. I like to freeze it – it freezes well. This is a classic Indian dish similar to butter chicken or other curries, and they’re easy to customize. Feel free to incorporate a spicy chili powder into the mix. Or use spicier peppers. 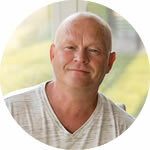 Check out my Curry Recipes for more wonderful curries. 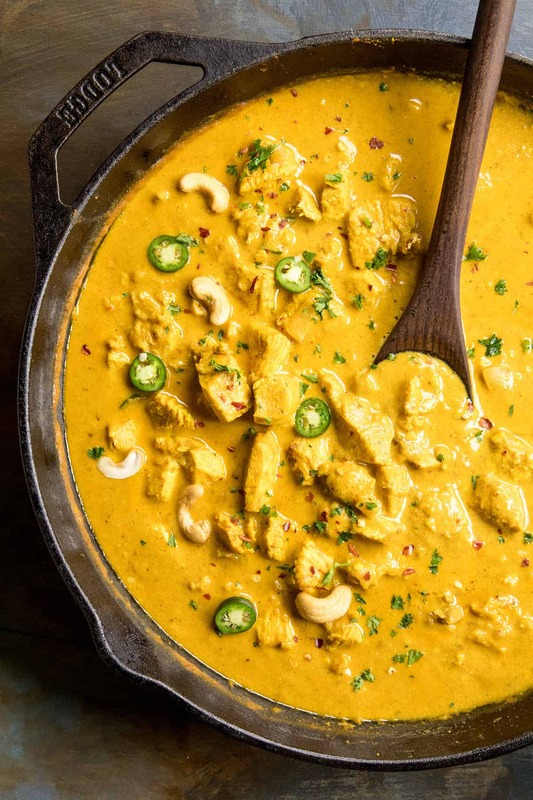 My chicken korma recipe is derived from classic ingredients and spices from India, with chicken marinated in a homemade korma paste and yogurt, then cooked quickly and simmered with cream. Mild in heat, but big on flavor, it's a spicy food lover's dream. Add the chopped chicken to a large bowl and set aside. Mix the paste in a small bowl with the yogurt. 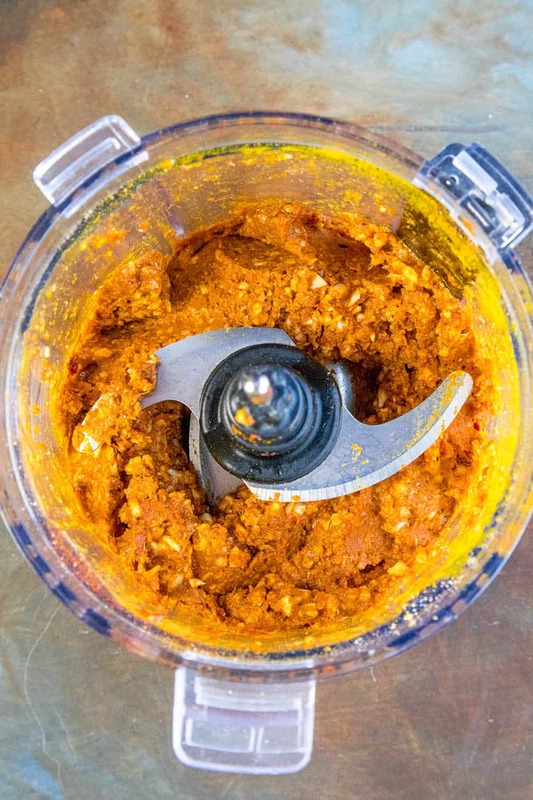 Spoon the marinade over the chopped chicken and mix well. Cover and refrigerate at least 1 hour to let the flavors develop. You can leave it overnight to develop even more flavor. Stir in the heavy cream or coconut milk and simmer for 10 more minutes. You can simmer longer if you’d like to let the flavors develop more. Heat Factor: Mild, though it is very BIG on flavor. 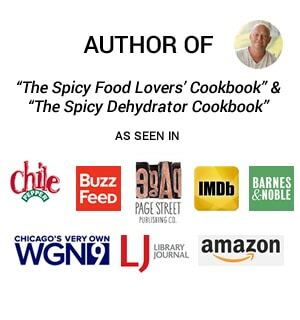 You can easily add some heat by incorporating spicier chili peppers and/or spicy chili flakes. Made this recipe last night and it was very good, Had the left overs this morning with a fried egg on top. Outstanding! I love the leftover idea! Making that for myself soon! 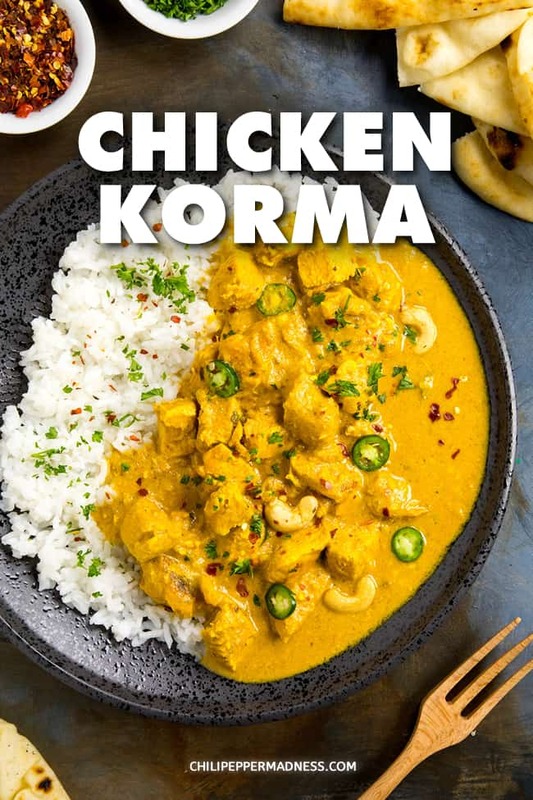 This is a nice chicken dish but not a qorma plz .. original qorma dish never uses tomatoes turmeric corainder .. qorma gravy has a dark look not turmeric look . Shirazi, there are many regional variations of korma, so the ingredients will differ from region to region. Tomato paste is optional. Very true. 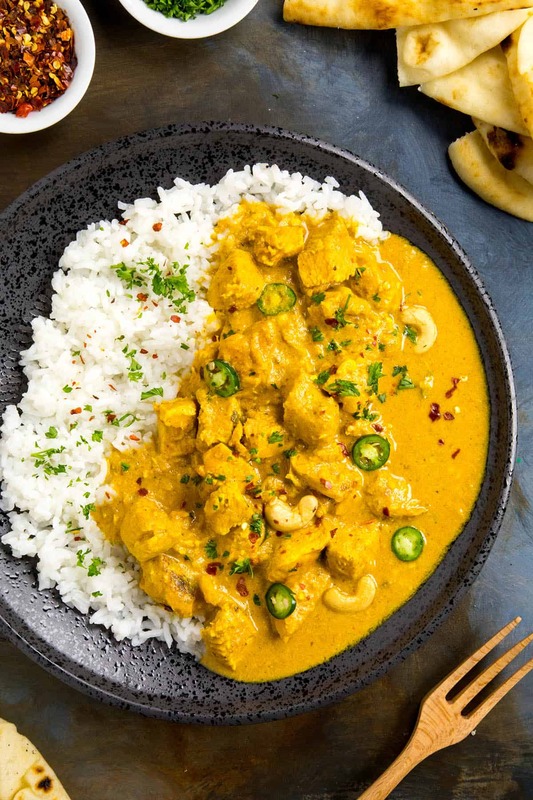 Korma varies from place to place and color depends on the amount of turmeric, coriander cayenne pepper. If you want to enhance the taste and almond paste too. Its awesome. Thanks, Vardhini. Excellent advice, my friend. More almond paste for me for sure.